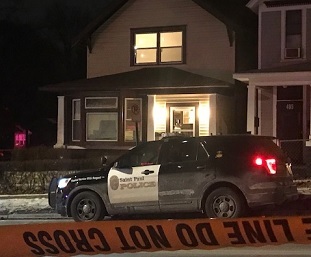 Officers responded to a house on the 400 block of Maryland Avenue East early Saturday morning after 911 calls poured into the Ramsey County Emergency Communications Center. Callers reported that multiple people had been shot at about 3:30 a.m., and when officers arrived they encountered a chaotic scene involving more than 20 people, two of whom were suffering from apparent gunshot wounds. Officers immediately rendered aid to the victims until Saint Paul Fire medics arrived. An adult male was transported to Regions Hospital and treated for what is believed to be a non-fatal gunshot wound. Another adult male victim was pronounced dead at the scene. Patrol officers established a crime scene perimeter and called for investigators with the Saint Paul Police Department’s Homicide Unit to respond. A bus brought approximately 20 possible witnesses to the police department’s Headquarters for questioning. At this time, no arrests have been made and the victim’s identity and exact cause of death have yet to be determined. His body will be transported to the Ramsey County Medical Examiner’s Office, where an autopsy will be conducted. In the meantime, homicide investigators are working to determine what led to the shootings and who is responsible. The police department’s Forensics Services Unit will also process the scene for evidence. Anyone with any information is asked to call Saint Paul police at 651-266-5650. This is an open and ongoing investigation and no further information is currently available. Once the victim is positively identified and family notifications are made, his name and age will be released via the police department’s Twitter account, @sppdmn. This is the third homicide of 2019 in the City of Saint Paul.